Oysters are bivalved molluscs which live in saltwater or brackish water. There are many different types, not all of which are eaten. Those which are eaten may be prepared a number of different ways, including eating raw, baking, boiling, broiling, frying, pickling, roasting and stewing. Step out of your comfort food and take a trip around the world with Reese Medium Smoked Oysters. Sourced with international delicacies in mind, Reese finds the highest quality products from different corners of the world, focusing on taste and affordability. Reese Medium Smoked Oysters are great for adding to a seafood stir-fry. Their large size adds a perfect texture for any oyster lover. Reese has one goal: to bring the highest quality products from around the world offering artichokes, hearts of palm, capers, seafood, sauces and more, straight to your kitchen. We have been America’s most trusted name in gourmet specialty ingredients for almost a century. 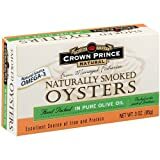 Sustainably grown and harvested in the open ocean, Crown Prince Whole Boiled Oysters are fully cooked and ready to use in your favorite stew, chowder or stuffing recipe. Clean and fresh tasting, they are packed in water in convenient ring-pull cans. Visit the Crown Prince website for recipes. Ocean Prince Boiled Oysters are packed in water using only whole oysters. As with our Smoked Oysters, we pre-approve all production codes prior to shipment. These Boiled Oysters have a clear, clean appearance and taste without any sand or grit. Visit the Crown Prince website for recipes. 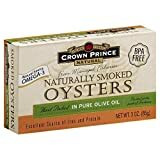 Crown Prince Natural Smoked Oysters are naturally smoked over oak and are packed in pure olive oil. These delicious oysters are harvested in South Korea and are considered to be of the highest quality available. They provide an excellent source of protein and iron. Smoked Oysters are perfect for appetizers, sandwiches, pizza or straight out of the can. Our Smoked Oysters are naturally smoked over oak and are packed in pure olive oil. These delicious oysters are harvested in South Korea and are considered to be of the highest quality available. They provide an excellent source of protein and iron. Smoked Oysters are perfect for appetizers, sandwiches, pizza or straight out of the can. Crown Prince Smoked Oysters are naturally smoked, and are of uniform size and color. As one of the largest importers of smoked oysters in the world, we are able to source only the highest quality of oysters available. Each and every production code is pre-approved prior to shipment ensuring that our high quality standards are maintained. Try them in appetizers, sandwiches, pizza, or straight out of the can.